Ubisoft’s Far Cry 5 launched last week on all platforms to solid critical acclaim (including ours) across the board. 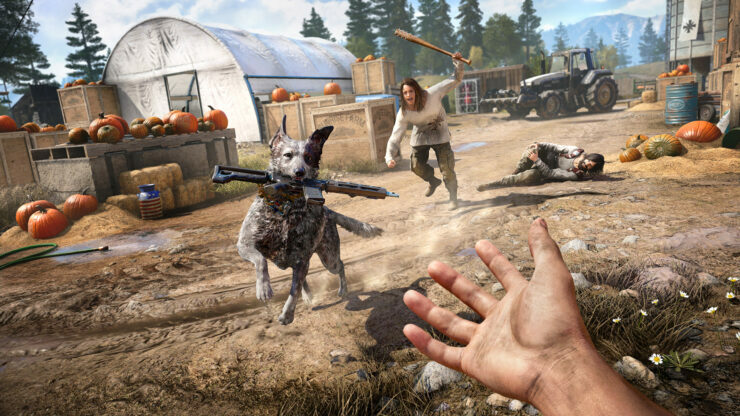 Of course, publishers are more interested in how games are actually received by their customers and in that regard early Far Cry 5 sales reports showcase that Ubisoft has another winner in their hands. In fact, the latest entry in the open world first person shooter series has broken franchise records. For instance, GamesIndustry.biz reports today that Far Cry 5 sales in the UK not only make it the fastest selling game in the series but also the most successful game to ever launch during the thirteenth week of the year, beating BioShock Infinite (launched on March 26th, 2013). It’s also the biggest launch in the UK to date this year and the PlayStation 4 version (which made up of 60% of the sales in the launch week) is the sixth biggest launch of a Ubisoft game on an individual format. Below you can find the remaining games in the Top 10 chart. That was about retail Far Cry 5 sales, but digital sales – at least on Steam – are going very well, too. According to SteamSpy, the game was purchased by almost 550K users and its peak of concurrent users (92K) is almost four times higher than the previous one (23K) set by Far Cry 3. Furthermore, Ubisoft games tend to sell well on UPlay too, though we don’t have any data on that platform yet. In his review of the game, Kai highlighted the strong feature set of the Ubisoft title. If you’re wondering whether bringing the madness to our doorstep, making the entire campaign co-op and including an impressive toolbox (Arcade Mode) to create new levels and missions while still retaining that visceral gunplay the series is known for keeps Far Cry 5 fresh and worth playing on Day One, my answer is: yes, absolutely.